When I think of velvet, I think of really uncomfortable dresses. I’m not sure why, something from my youth triggers it, but I just can’t remember what exactly. Anyhow. 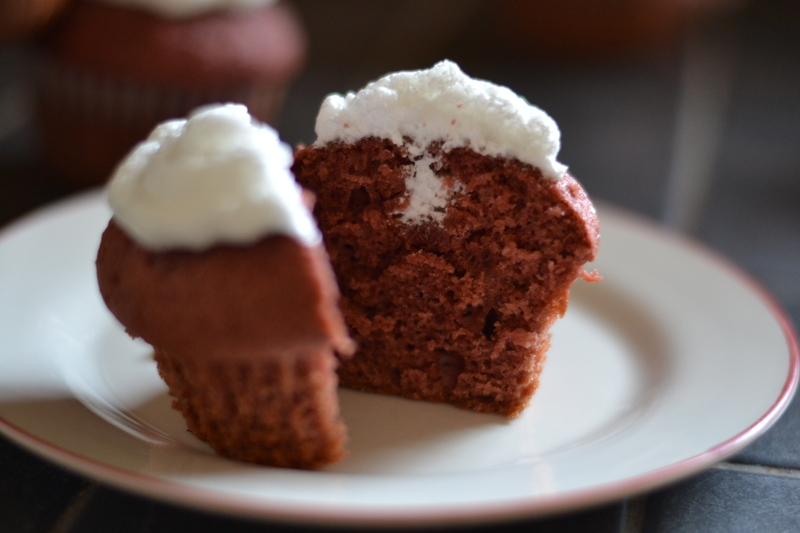 When I put that velvet picture in my head and add the words ‘red’ and ‘cake’….. Well, it just doesn’t seem quite right. Downright awful actually. But, I was wrong. There. I’ll admit it [for once]. I. Was. Wrong. A friend asked me the other day what was so big about ‘Red Velvet Cake’. I responded that I wasn’t sure, but I didn’t think it was anything too crazy. So, I proceeded to look them up (I had before, but hadn’t looked at it too hard…). Anyway, it wasn’t anything too crazy, so I thought I’d give it a try. 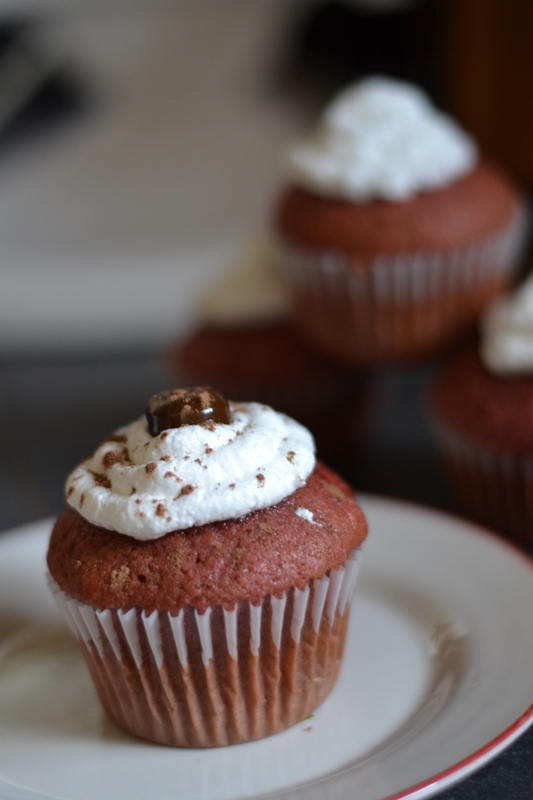 I found a recipe on Bakerella, but I tweaked it a tad, and made it into cupcakes instead of just a regular cake. Preheat oven to 350. Pour milk and vinegar into a measuring cup, set aside for 10 minutes. 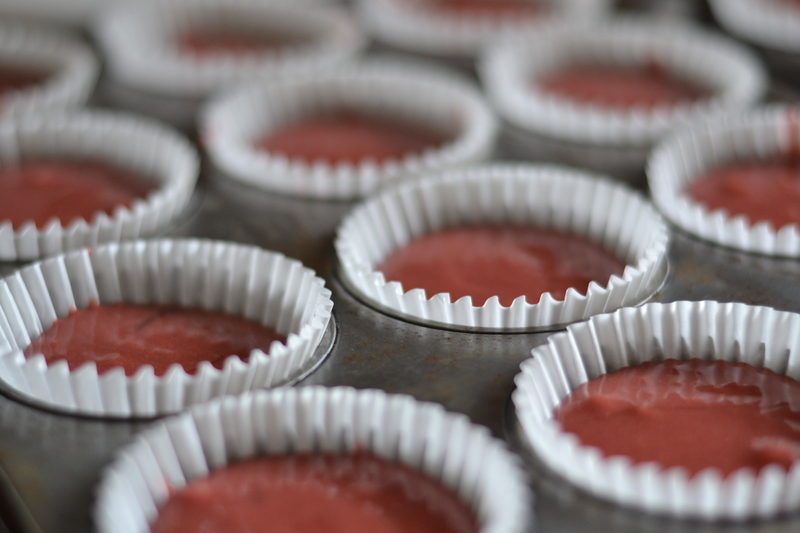 Line cupcake pans with liners. Whisk eggs lightly. Add remaining liquids and whisk until blended. Stir in cocoa and sugar. Add flour, salt, and baking soda. Mix until smooth. Pour into cupcake pans. Bake for 20 minutes (or until tester inserted in middle comes out clean). Anyhow. It was kind of a busy day making these. I had two younger brothers to feed, and a baby who just loves attention. But! I prevailed, and they turned out pretty good I must say. After I had delivered my cupcakes to my friend (who had mentioned them to me), I got home to less cupcakes than were there when I left. Turns out they were too good to just look at. An additional brother landed home while we were gone and just couldn’t help himself. A piece of interesting factual information for you about red velvet cakes – they are called red velvet because of their colour. (Duh, right?) 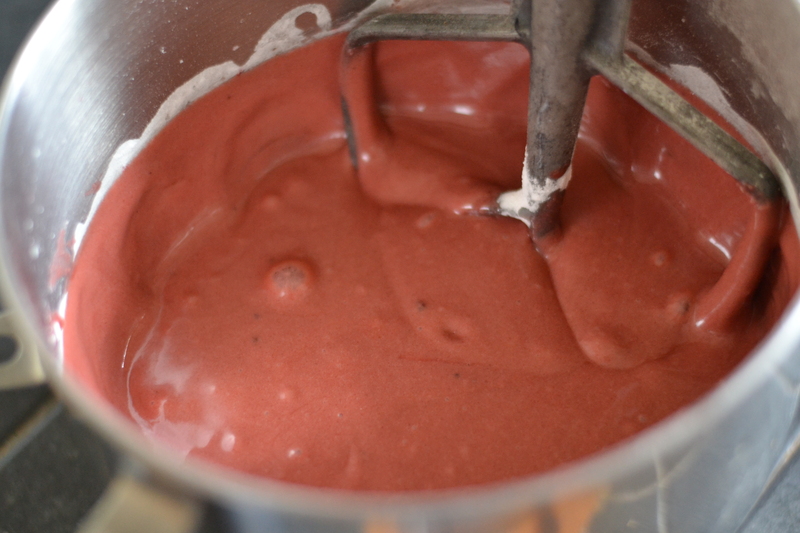 The cake turns red because of a chemical reaction between the cocoa and the buttermilk (or vinegar). It also turns red because of added RED food colouring. Apparently, most cocoa used to be lighter than it is now, and it turned cakes more red, but cocoa is darker now, and while it still turns slightly brown-ish red, colouring is needed for the full effect. You can still buy the lighter cocoa though. In a saucepan, combine sugar, water and cream of tartar. DO NOT stir. At all. Okay? Bring to a boil, and boil for about 10 minutes. While you’re waiting for that, put the egg whites and salt in a mixer, and whisk until whites are peaking. 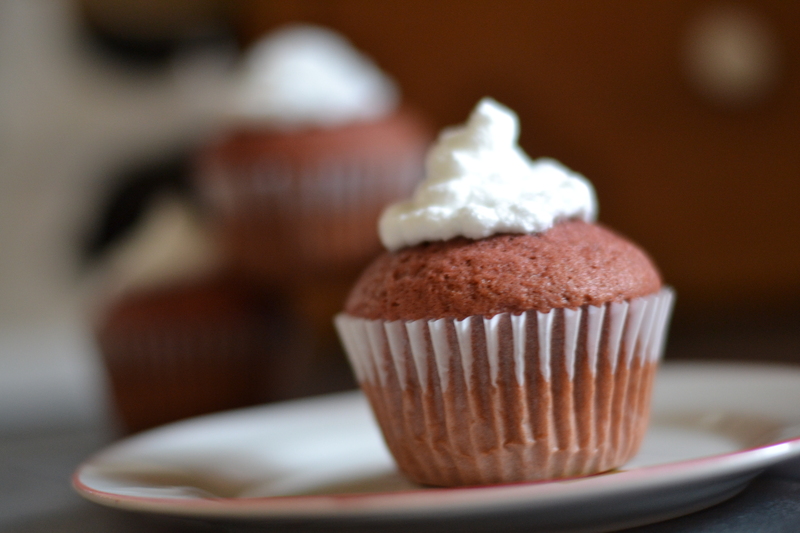 Pour sugar water over egg whites and beat the frosting for 7 minutes (hence the name of the icing…). Add vanilla extract. The icing will be really nice and fluffy. And it will taste sooo good. I had a LOT of icing left over from the cupcakes… And my hubby just so happens to LOVE (that’s right folks.. another baked good he’ll actually eat) chocolate cake with boiled icing. So. 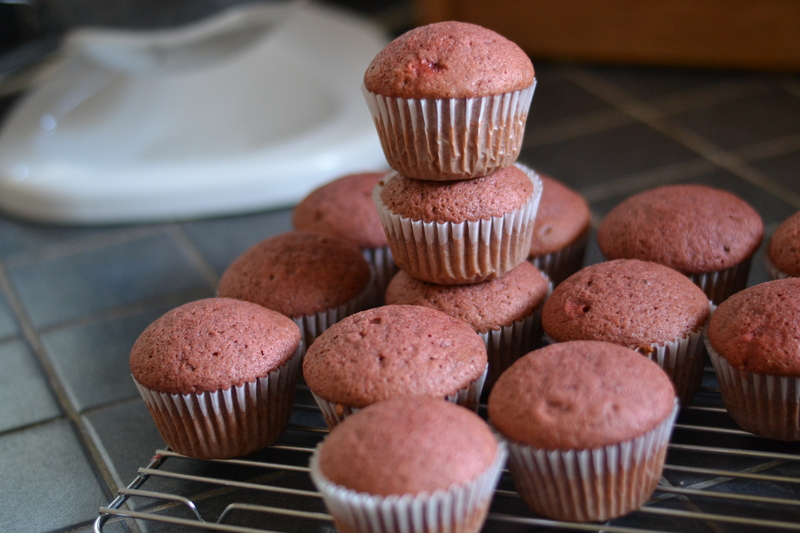 After my cupcakes were made, iced, and delivered. . . . . . (it took awhile) . . . . ……. I set out to making a chocolate cake. (Needless to say, I didn’t get a whole lot else accomplished this day!) 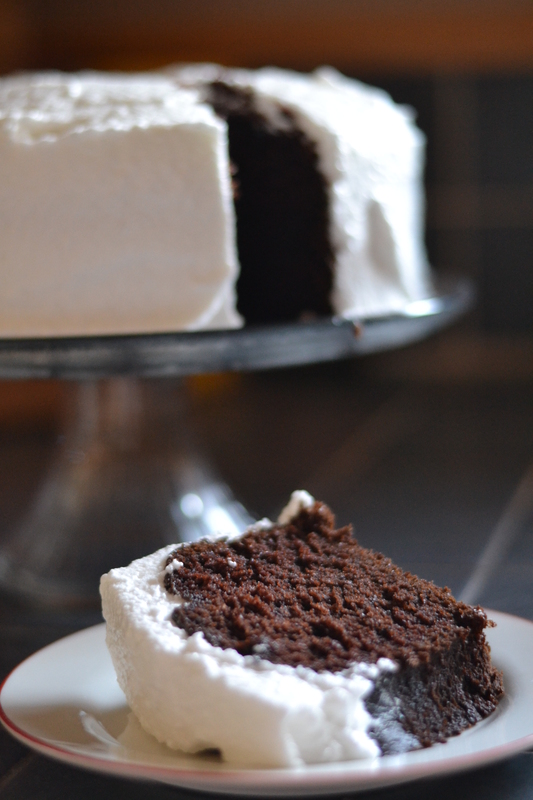 I made this chocolate cake recipe and slopped ALL the rest of the icing on it. It was pretty delicious. Notice I [attempted] to pipe the icing onto the cupcakes… it didn’t work so amazingly well. 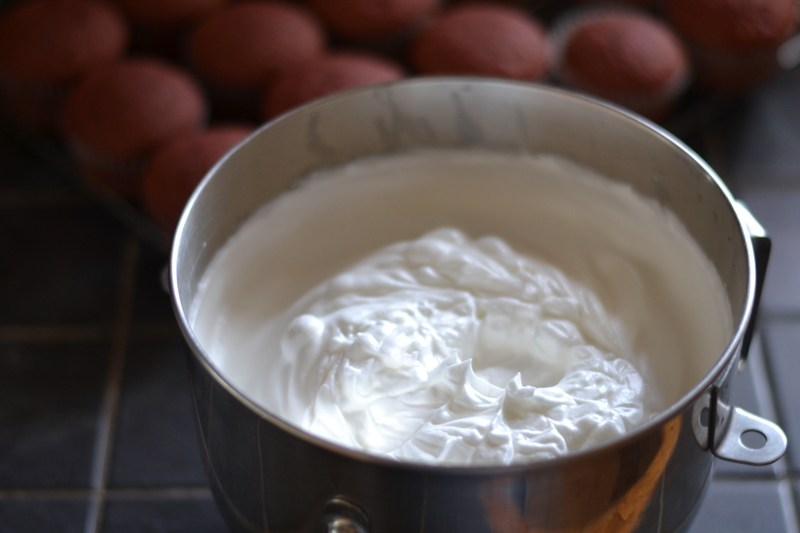 Boiled icing isn’t quite the right consistency… but it worked. Just thought I’d give a warning there. You WILL make a mess if you attempt to do that. I would suggest using a flat spatula, and smoothing it on instead (as I did on my cake). Ever tried a red velvet cake before?